Well, sorta, kinda. Does taking your dot off your spare M41 and taking it to the range and seeing if the iron sights are still on count? Then yes, I am getting prepared for the 22 match. I am actually looking forward to it. It was amazing at last months 2700 how few shooters had even heard of it. Might be a low turnout till word gets to everyone. I plan on shooting the 41 this month for the 22 portion of the 2700. You can practice for the Distinguished by keeping your pistol in the International ready position until the target turns. Great minds think alike. I got out the iron sights rib I bought to put on my spare Marvel, only to find that the dang rib is on so tight, I can't get it off. Gunsmith may be in order. I would prefer to shoot my AW-93 already set up for international, but with the recoil buffer, it seems to be one of those excluded guns. At least the CMP has it listed on the schedule for Camp Perry so maybe people will notice. I think the first one will be at the CMP games in Oklahoma this weekend. It will be interesting to see the scores. I wanted to be there, but just could not make it. I've been shooting my 22 matches this way for a few matches. It's tough. Why is the AW-93 not allowed? That's what I'm using. DeweyHales wrote: I've been shooting my 22 matches this way for a few matches. It's tough. It has a recoil buffer. As I read the rules, guns with recoil buffers are not allowed. You can take it off, and maybe that would be OK, but it leaves the AW very muzzle light, when you do. Does the AW-93 have a non weighted compensator style buffer? I think that was the limit but an email to CMP might be called for. My plan is to shoot the Nygord Pardini. It's old enough not to have the adjustable weights, but still keeps the muzzle down, just fine. jmdavis wrote: Does the AW-93 have a non weighted compensator style buffer? I think that was the limit but an email to CMP might be called for. My plan is to shoot the Nygord Pardini. It's old enough not to have the adjustable weights, but still keeps the muzzle down, just fine. Not really. It adds quite a bit of weight. It is a very high tech spring like shock absorber. I can't imagine it actually being legal because I suspect that it is exactly the type of gun, the rules were written to exclude. A weight system is not operating in a a similar manner to any of the above. It seems like they went a long way to leave out weight based systems. If the AW93 wasn't legal, I wouldn't think the Pardini SP New or Bullseye SP would be either. Any system of recoil control based on a compensator, barrel venting, barrel porting, moveable weights or other recoil reduction system is not permitted. I don't think they intended the new Pardini, the Bullseye SP, or the AW-93 to be legal. Someone shooting one will come along and ask the CMP, then we will know for sure, but they made a point to put weight systems under the Service Pistols and not to put it under the .22. Does shooting international pistol for 20+ years count? If so, then yes, I am "prepping". 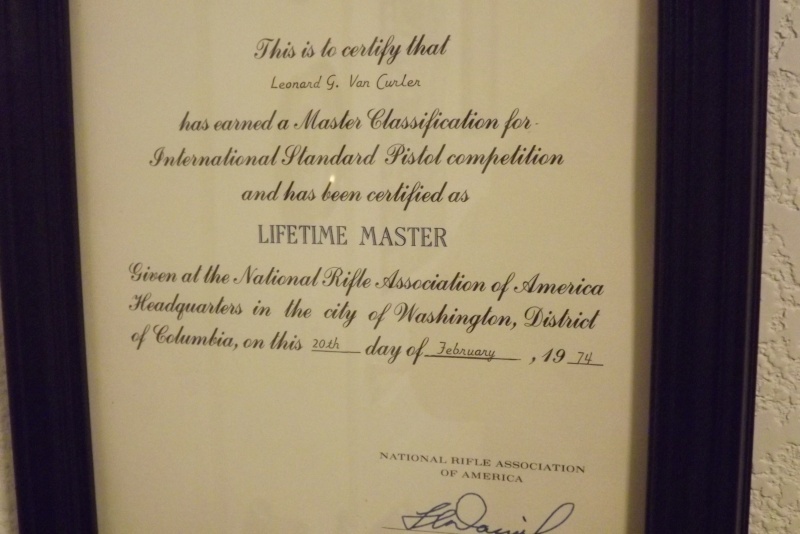 John Bickar wrote: Does shooting international pistol for 20+ years count? I'm hoping that your Standard pistol skills are so rusty you forget the lift. Not really. I'm actually expecting you to be one of the first few to earn the badge if you decide to do it. I am pretty sure they would consider that prepping. The problem is they are probably going to make us shoot the match and not just send out the award. I also spent some time shooting Standard Pistol. I think I still remember how. I hope I don't keep dropping the pistol back down after the first round. I probably have fired 10x as many Sport Pistol matches as Standard Pistol. Oh well, back to loading bullets. Found this old thing laying around in the gun room. Not likely to be me, due to lack of opportunity. It took me a few years to earn my Distinguished Revolver; Northern California is not the bullseye oasis that Northeast Ohio is. OldMaster65 wrote: The problem is they are probably going to make us shoot the match and not just send out the award. Would somebody provide a link to the allowable pistols? Thanks! There is no list of approved .22 pistols. There are criteria for approved pistols. Says nothing about moveable weights?? The way this reads is any "gas operated" recoil system isn't allowed. Would sprung weights pass? The service pistol specifies that weights are not allowed. The .22 does not mention weights. I copied both from the new rule book. The differences in these requirements cannot be accidental. For the .22, moveable weight systems ARE PERMITTED because they are NOT venting/porting and because that language has been deliberately omitted. I'm not an authority, just reading the rules critically and carefully. I hope I'm right because I'm planning to shoot my Pardini SPBE at Camp Butner in three weeks. Does anyone know at what point I have to raise my pistol off of the bench? I understand I can't raise until the target turns, but could I keep it on the bench until that time? Just trying to get my shot process right. Your pistol must be at International Ready and off the bench before the target turns. If you are unable, due to bench height, to be at the ready position, the pistol must still be in a low(er) position and off the bench before the sustained fire stages. Phil, we've been in the ready position during the "ready on the" portion of commands. Clark and Willie are looking into exact timings. Matches will start soon, and we'll know. My reading of the rules says my AW-93 will be out there. If it's disallowed, I've got plenty of other 22s that'll be fine. I'm shooting all irons. It'll be fine no matter.